The Hermitage Hotel is named after Andrew Jackson's Estate - The Hermitage Estate. This hotel is the oldest hotel in Nashville, and it was finished being built in 1910. At the time, the Nashvillians, who built this lovely hotel, thought of themselves as being quite worldly, and had it in their minds that Nashville was going to be a great arts center of the South, USA. They took to calling Nashville the Athens of the South. If that were to be, the hotel had to have all the finest materials from Europe and Asia including Italian marble and blown glass, Persian rugs, and Russian walnut wood. The Hermitage Hotel still has these fine materials, is fabulously grand and a historic hotel. About the Athens of the South thing, well, that never really happened. The glory of this hotel is that it was built originally to house the Tennessee politicians, all men at the time, for their trip to the Tennessee State House (which is across the street) to do their important politicking at the time. Then in 1914, The Hermitage Hotel was the site of the National American Women's Suffrage national convention, which started off a lot of rumors that Tennessee was going to be a strong player in backing American Women's Rights to Vote. The six long years later in August 1920, it was up to Tennessee to cast the final vote to allow or dis-allow women to vote. During this year, there was only one hotel to stay in, it was the Hermitage Hotel, and both Ayes and Nays were staying at the hotel. The only way the politicians could tell who was for or against Women's Rights, was the color of the flower worn in the lapel of the jackets. It was August in the south of the USA, and these people had to be out of their minds to be wearing jackets and long sleeves in 100 degree weather. Jackets in the heat aside, the politicians and lobbyists, who were against Women's Rights, wore red roses in their lapels, and the politicians who were for Women's Rights, wore yellow roses in their lapel. Today, the Yellow Rose is still a symbol of Women's Suffrage today. Back to August 1920... That great hot day of August 18, 1920, freshman Representative Harry Burns, who wore a red rose, had a visit from his mother. She told him to vote the right way. All representatives voted, except for young Harry, and the count was 48-48. The anti-rights red rose politicians thought they had won a victory for the oppression of women. Then young Harry cast his vote, most likely remembering his mother, and he voted to ratify the 19th Amendment to the US Constitution giving women the right to vote. All 48, anti-women's rights representatives chased poor Harry up to the bell tower of the Capitol Building of Tennessee, and there Harry stayed all night, afraid of being attacked by an angry group of anti-rights politicians. Harry, of course, was staying at the Hermitage Hotel, but wasted his room charge for that August 18, 1920 night due to his hiding in the bell tower. When the Hermitage Hotel was built, the basement was installed with an Oak Bar and Rathskeller. It was going to be a private, men only, drinking and smoking club. The men who were going to frequent this place, of course were the politicians and lobbyists who wanted to do power plays over a glass of whiskey or beer. Today, the Oak Bar is still a bar, the men's room is still beautifully Art Deco designed with hand made glass tile, and the rathskeller is now the Capitol Grille Restaurant. It should be noted that this restaurant is NOT affiliated with the chain restaurant Capital Grille (with an A not an O in the word capitol). 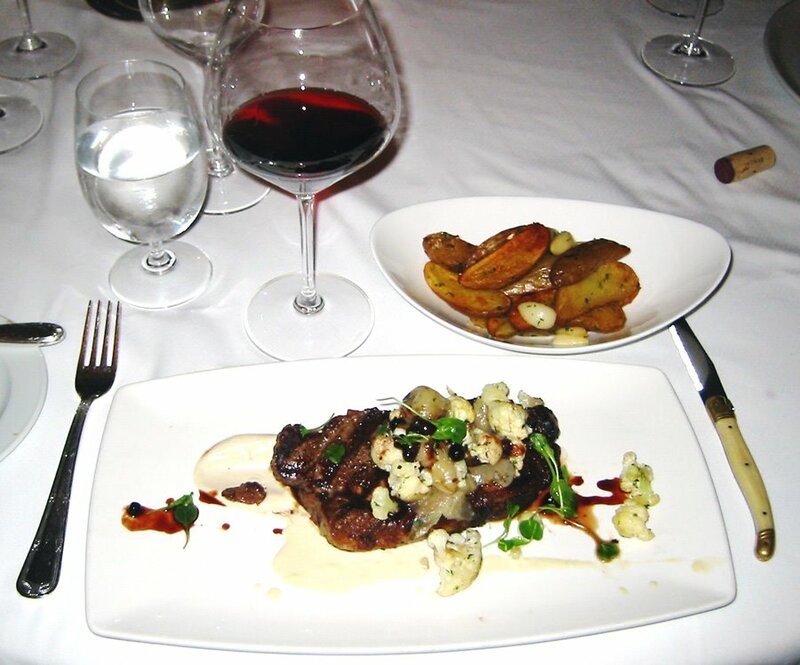 The Capitol Grille is its own restaurant. 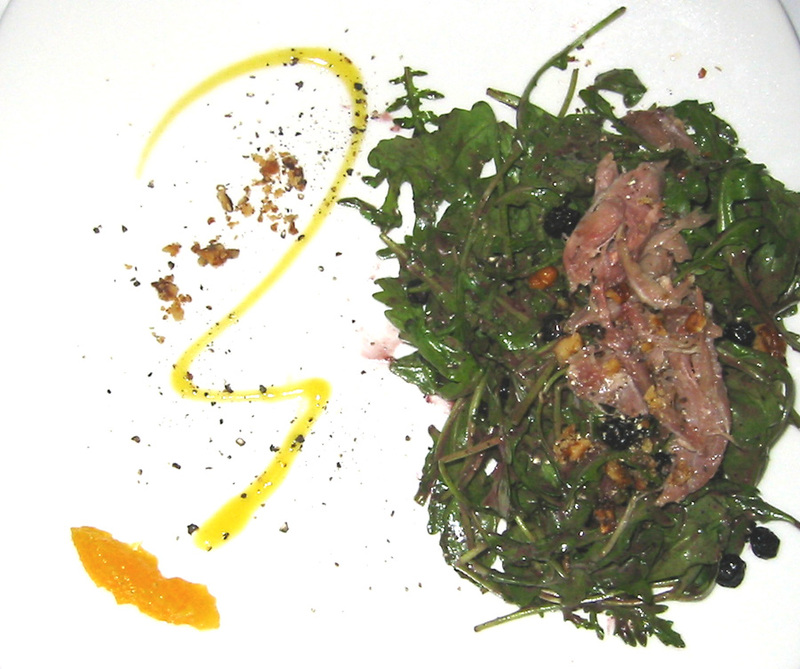 In 2003, the Capitol Grille got a new, young, 24 year old, Johnson and Wales educated, Executive Chef named Sean Brock. He was young, had no fear, and propelled the Capitol Grille into earning a AAA Five Diamond award in less than one year. This is Nashville's one and only AAA Five Diamond award, and Sean Brock got the attention of foodies world wide. Last year, a couple Germans flew in for a visit just to try Sean Brock's 13 course tasting menu made just for them. The tasting menu is not on the menu, you just had to be in the know that Sean Brock would create a chef's choice culinary experience, as long as you call ahead a few days in advance. Sadly, this April 2006, Sean Brock went to seek new horizons in South Carolina. Tyler Brown, the new guy, isn't Sean Brock, but I think he is trying to carry on the tradition of innovation and experimental excellence. 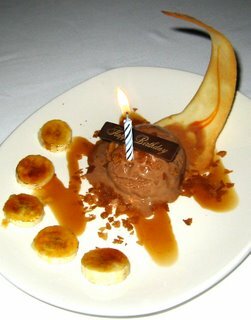 We went to the Capitol Grille to help celebrate a birthday for a special mom from Ohio, and she wanted to try the Capitol Grille. The menu had interesting items on it. What we ended up ordering to start were the sweet onion soup with bacon and cheese, arugula salad with duck confit, and crab cakes with avocado mousse. 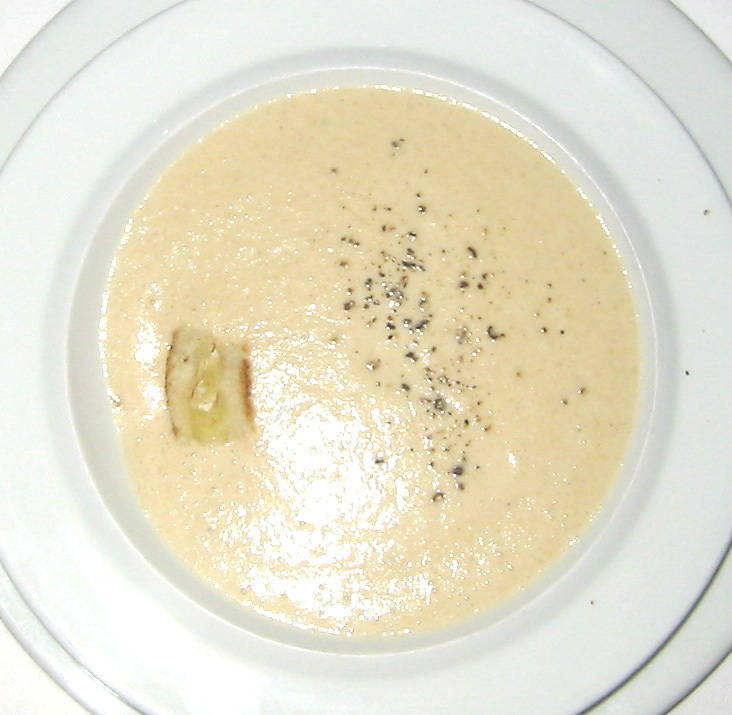 The verdict, the soup rocked. It was a light cream based onion soup, it was not too salty like some French onion soups can be, and it felt velvety while eating it. The salad was dripping in the vinaigrette, so it was difficult to taste the slight bitter and refreshing flavor of arugula. I read an online review that said the same thing about his salad, and that they put too much salad dressing on the salad greens. For the next course, we ordered steak, lamb and yellowtail snapper with the additional sides of truffle oil mac and cheese, potato wedges, and fried green tomatoes. While in the south USA, one must try fried green tomatoes, and not to be confused with the movie of the same name, Fried Green Tomatoes. Ohio mom opted for the lamb, and I heard hide nor hair from her until she was done with her plate. I have a feeling that she really enjoyed her lamb. This is the first time I have ever had a fried green tomato, and I suppose because I did not grow up in the south, I did not appreciate the side dish as much as others. Now, the Mac and Cheese with Truffle Oil side dish was $8 plus tax and tip, putting the dish up to $10+, and it was the best Mac and Cheese I have ever had. Through my years of tasting food made with truffle oil or truffles, I totally get why these little fungus are so expensive and coveted by the French and foodies everywhere. The essence of the truffle just filled my mouth and nose with that earthy, savory specialness, and elevated the simple noodle dish to a level of all its own. 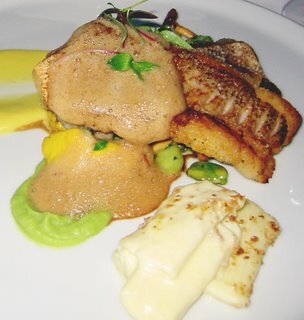 The fish came with a bunch of different sauces, foams and mousse smears. It was a bit confusing for me, but I am sure it makes sense to someone. A couple people ordered beef dishes, and the one thing they did get correct in the kitchen was how to cook a rare steak. Rare means a cold and red middle, not warm and pink/grey inside. The cooks understand how to cook a rare steak. I think everyone was thinking the main course was ok. The plating was a bit culinary school-esque with too many accessories, that could crowd out the natural flavor of the food itself. We weren't completely wowed or knocked out of our socks, but it was an interesting trip into food. THEN, we entered into the desserts. We got two desserts for the table, and one was a chocolate gelato, and the other was a 4 flavored tasting of creme brulee. The chocolate dish was excellent, but completely sent to the background by the cayenne chocolate, vanilla, lemon grass and ginger, and pina colada flavored creme brulees. As I tasted each one only once, I was so sad to have to send them down the table to the next person. I was so sad to see these tasty treats go. I did not want to be a pig, so I wasn't, but I could have! If I ever come into a lot of money, and I find myself back in the Capitol Grille, I know exactly what I am ordering: the Truffle Macaroni and Cheese, and the Creme Brulee. Veggies and a main course, who needs it when there is Creme Brulee? UPDATE August 15, 2010: iPOH unfortunately has closed, and has not reopened. There are no Malaysian style restaurants in Nashville, that I know of at this time. I have been hooked on a Malaysian Food Blog called Masak-Masak, and one specific entry about Char Kuey Teow. 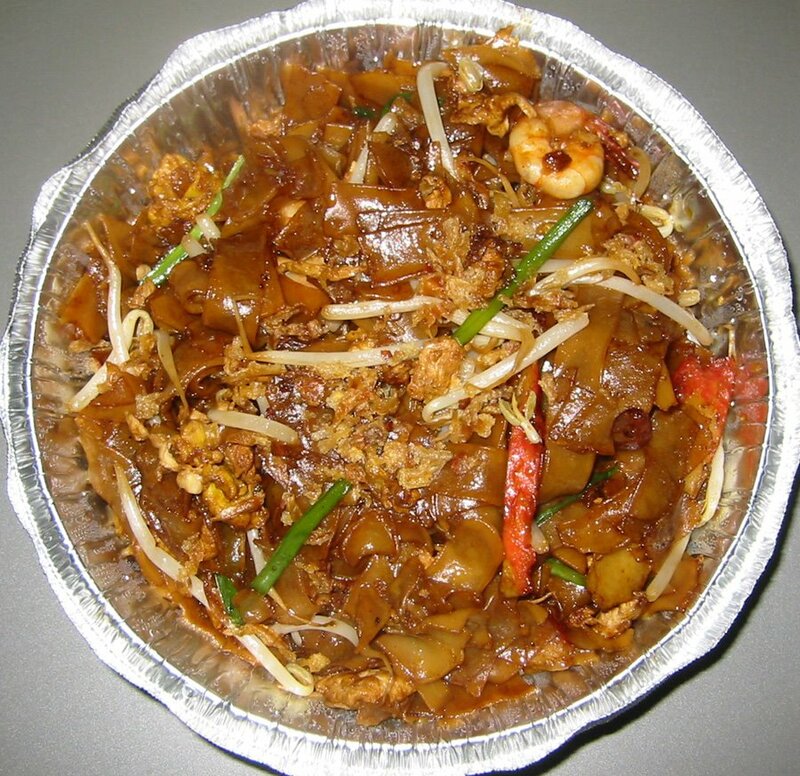 Char Kuey Teow is made from rice noodles and lots of other ingredients stir fried very hot, to the smoke point, in a wok, and then piled on a plate to enjoy. Up until now, there has not been a Malaysian restaurant in Nashville, and the next closest town is Atlanta, GA with a Malaysian restaurant. All I could do was look at Masak-Masak, and dream about Char Kuey Teow, until now. There is a Chinese Malaysian man in Nashville who owns Chinabell in Madison (a Chinese restaurant), and now iPoh (a Malaysian restaurant). When I first saw a flier for the FIRST Malaysian restaurant in ALL OF Tennessee, I high tailed it down Nolensville Rd to try some for myself. The restaurant is in the back end of an old style Walmart shopping center. For those who knew where the old Savarino's Italian Bakery was, iPoh is right next door. The restaurant is beautifully decorated in airy, crisp and Asian-esque design. I would like to eat in there one day. I did some take-out of iPoh's version of Char Kuey Teow, and Chow Fun. It was ok, but missing that special Malaysian stall food something. It is the best I can get for over 200 miles around. I had a funny conversation with the iPoh greeter about the iPoh's food and East Asian food in Nashville in general. I was showing her a list of Chinese and Malaysian food that I would love to find in Nashville. She looked at my list, said she was Chinese, commented that she thought each item was good, seemingly complimented me on my choices, and even said she missed the taste of some. She then went on to say that I should know by now that it is impossible to get anything on my list in Nashville, and I would have to go to New York for those dishes. Every East Asian owned restaurant in Nashville, I ask for the same thing, at least one dish made the way that real East Asian food should be made. I get the same answer that it doesn't exist and I need to go to New York. These restaurant owners know exactly what I am talking about, and in fact, most grew up with excellent East Asian food, yet they do not offer real Asian food on their menus. 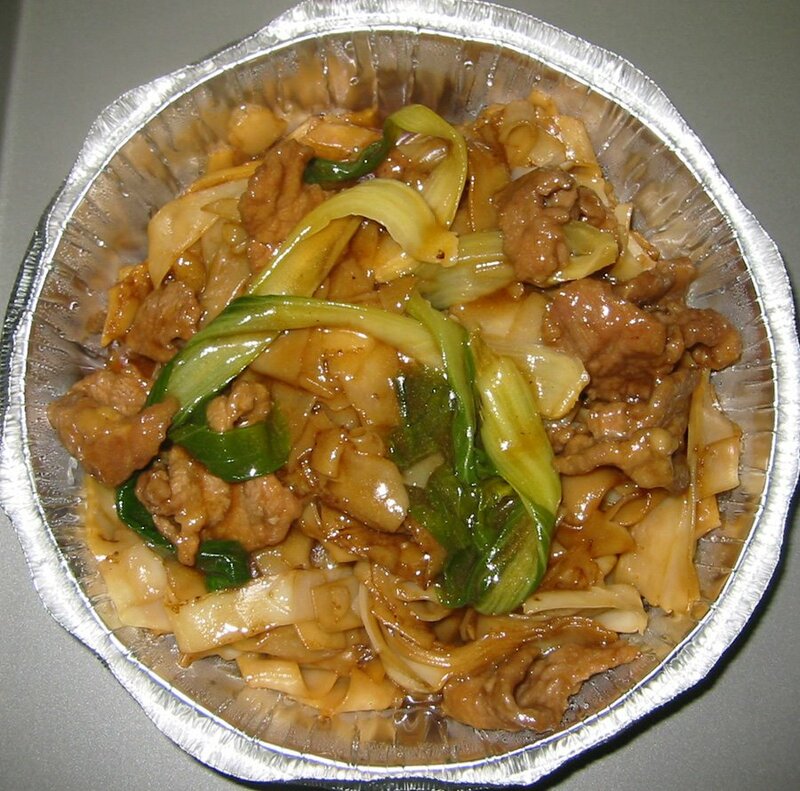 Why is it that there is such a resignation to bad Americanized Asian food here, when there are obviously people (including restaurant owners), who know what the good stuff is, and who want the good stuff? 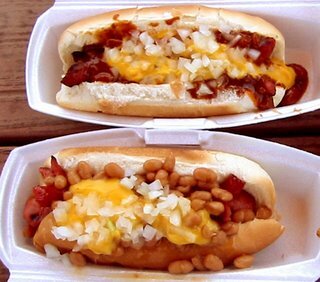 The sign for Hot Diggity Dogs is factual, and everything you need to know before visiting. This place is so very good with serving different regional hot dogs. I think that Layla and Gayle (owners of this place) are the best at what they do, that when I was in Chicago, I felt no compulsion to get a Chicago Dog because I can get an excellent one right at home. I am completely satisfied that I can get one of the best hot dogs here, that I did not want to risk being let down in Chicago by visiting a sub-par hot dog joint. In my mind, Layla and Gayle have set the hot dog bar rather high. 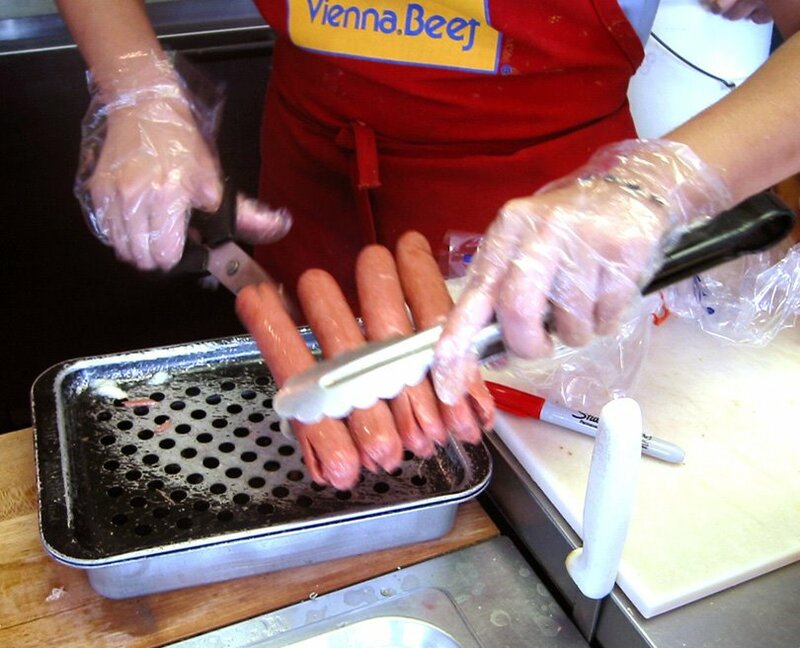 Since Hot Diggity Dogs is in Nashville, and the weather cooperates most months out of the year, there is outdoor picnic table seating with big Vienna Beef hot dog umbrellas to shield diners from the sun. There is also counter seating inside, but it can get crowded inside due to the popularity of this place during lunch. You can get a hot dog any way you want for $2.50. Choose a type of hot dog on the menu, pile all of the fixin's on, or eat it plain, it is your choice what to put on the dog for the same price. I choose them to grill mine on the flame griller as "extra charred" or "burnt". Before they do, they snip the ends so the dog doesn't curl up and char unevenly. There is he classic steamed dog too, if you would care for that. I usually get the Texan (top) made with chili, cheese whiz, and onions. I am in a rut, but it makes me happy to eat the hot dog. My dining mate got the Boston (bottom) which comes with baked beans, cheese whiz and onions. Having lived in Boston for a good many years, I don't think that Boston's hot dog identity includes baked beans and cheese whiz, but my dining mate assures me that Hot Diggity Dogs created a good hot dog anyway. The other thing I get when I go to Hot Diggity Dog is their french fries. They are made fresh to order, so they are not sitting around getting soggy, or tough. When you order fries, they put your portion into the frier right then. There is nothing like a fresh, hot, crispy on the outside, smooth on the inside, french fried potato. 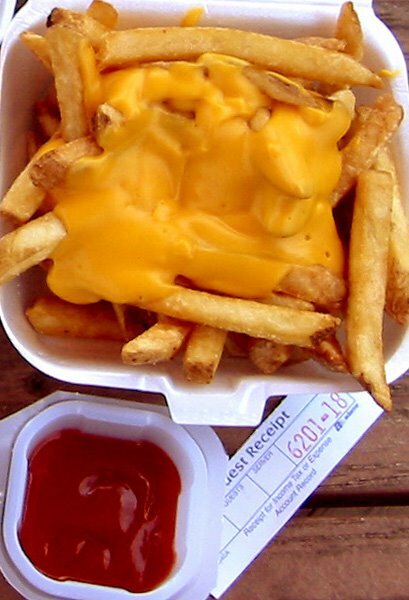 This time, I got cheese whiz with my fries. Plain, cheese, or chili cheese fries, they are all good here. I am back on the blueberry kick. I have been lucky this year that I got to put my hand picked organic blueberries up in my freezer, and I can thaw them and make things with them. I have also not thawed them and ate a few like mini-popsicles, which is highly recommended as a treat. 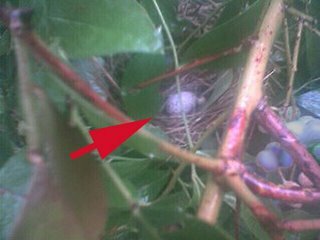 During one of my trips, in early August, to the blueberry patch, I saw a nest and an egg in the middle of a blueberry bush. I only had my cell phone camera that day, so I took a picture, and then moved on quickly as to allow the bird to come back and tend to its egg. The reason why I did not post this photo earlier is because I did not know how to download photos from my phone. As I am older that a high school kid, as a matter of fact am old enough to have kids that age, so I have no idea how portable electronics work, especially camera phones. Well, with time on the phone with the phone company to help me through the download process (I am sure the phone company was laughing at my ineptness), I downloaded the photo and was able to post it on my blog. Don't ask me to do download again, I could not tell you how. During my clueless download process, I totally had an epiphany about my grandmother and her remote control TV. In the 1980s, we gave her a remote control TV, of which she would get up and press the buttons to change the channel, despite the remote. This went on for 20 years+. I never knew why she never used the remote, even with repeated coaching from mom, uncle, us. It is for the same reason why I don't download pictures from my camera phone. Anyway, back to the blueberries. 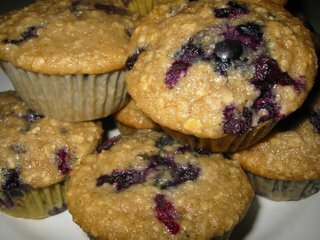 I thawed out about 1 1/2 cups of blueberries, and made oatmeal, wheat germ, blueberry muffins. They were packed with blueberries. I loved these high fiber gems! I fed them to Matt. I fed them to his family too! I was so happy to be able to sneak in whole food goodness into a muffin treat, and get no opposition to the health food! Now, how can I sneak in tofu and kale in a dish that looks and taste like a hamburger or alfredo sauce? I used to live in a mixed ethnic, religious and socio-economic area of Boston. What we had a lot of was good, cheap, ethnic food places. I never thought of the my local Jewish Deli as anything special, until I moved to the middle of no where Missouri for a couple years, and there was not one real pastrami slice to be had. 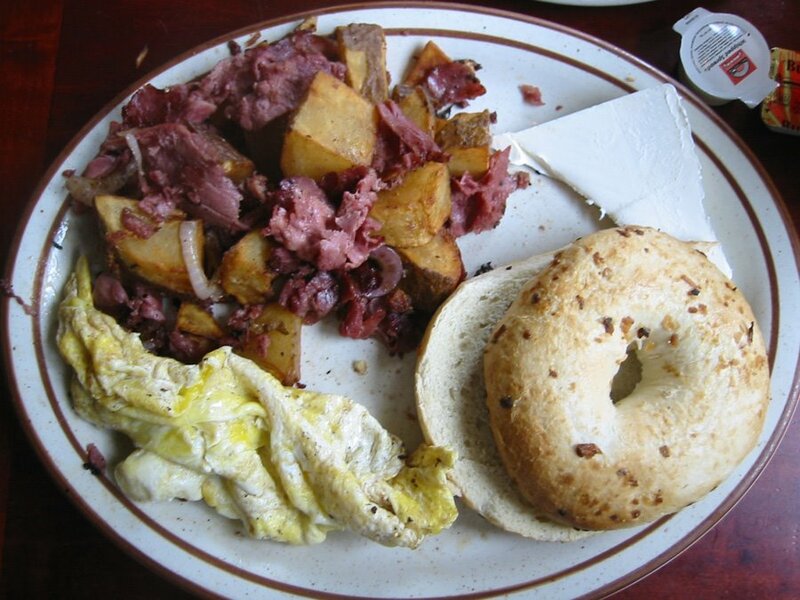 I missed my Boston Sunday morning (or shall I say early afternoon after being out all Saturday night) deli run for bagels, lox and juice, corned beef hash and latkes (potato pancakes), or a heart felt real pastrami sandwich. The place I used to frequent in Boston is a bit cramped, has a full deli case, it isn't pristine clean, the waitresses have a bit of an attitude, and the decor is a bit hipster-kitchy. When I finally emerged out of Missouri to Nashville, I went grocery shopping at the Belle Meade Kroger. On the back of the register tape was a coupon for Goldie's Deli, so I went and tried them out. What I found was real pastrami, homemade corned beef hash, and really good latkes. This place also had Carnegie Deli Cheesecake for sale by the slice. I was in heaven! There was not one good slice of cheesecake in Missouri either. The original Goldie's was a bit cramped, but it reminded me of my Bostonian Jewish Deli haunt. Goldie's is the only Jewish owned deli in Nashville, isn't pristine clean, and the decor is its own, kind of like my hometown deli. The only think lacking is the surly Jewish waitress. This year Goldie's moved from the Belle Meade shopping center to Murphy Road next to Cafe Nona, and there are no more coupons from the Kroger register tape. There is plenty of parking in the rear of Goldie's in a restaurant parking lot. The new place is crowded, but it is just as crowded as my Boston Deli. 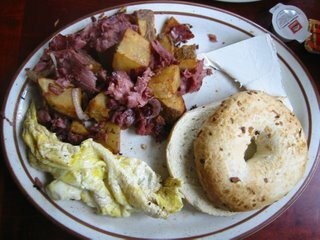 In my traditional Sunday morning (ok, really afternoon) breakfast, we got some corned beef hash, eggs, bagel and cream cheese, and a latke. 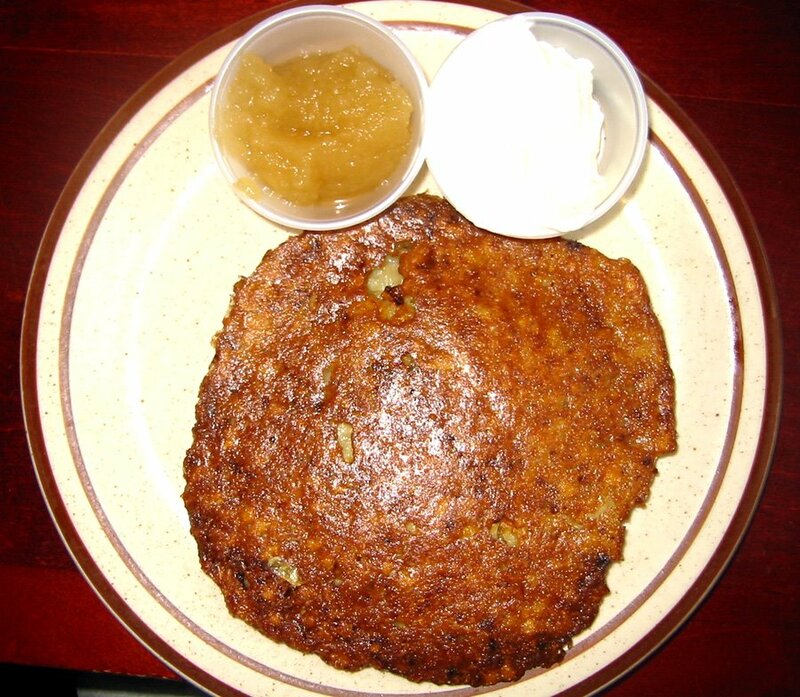 The potato pancake is as good as any Bostonian Jewish Deli. Potato pancakes should just be potato, or potato and onion, and either kind should be served with apple sauce and sour cream. Note, potato pancakes at the Pancake Pantry are no traditional potato pancakes, and are not good. This homemade potato pancake really feeds my nostalgic heart for the good ol' days of Boston. I don't go to Goldie's all that often, but when I do, I really enjoy my breakfast! To find Horn of Africa Restaurant, DO NOT look for it from Murfreesboro Rd, even though the address may lead you to look for it there. What you need to do is drive on East Thompson Lane, where the 5th Quarter, CVS and Dollar General Grocery stores are. Drive into the parking lot that is between the Dollar General Grocery and the 5th Quarter. Continue into the parking lot towards the Office Depot, and before you get to the Office Depot, look to the RIGHT at the the last store of the strip mall that is on the right, and you shall see Horn of Africa Restaurant. 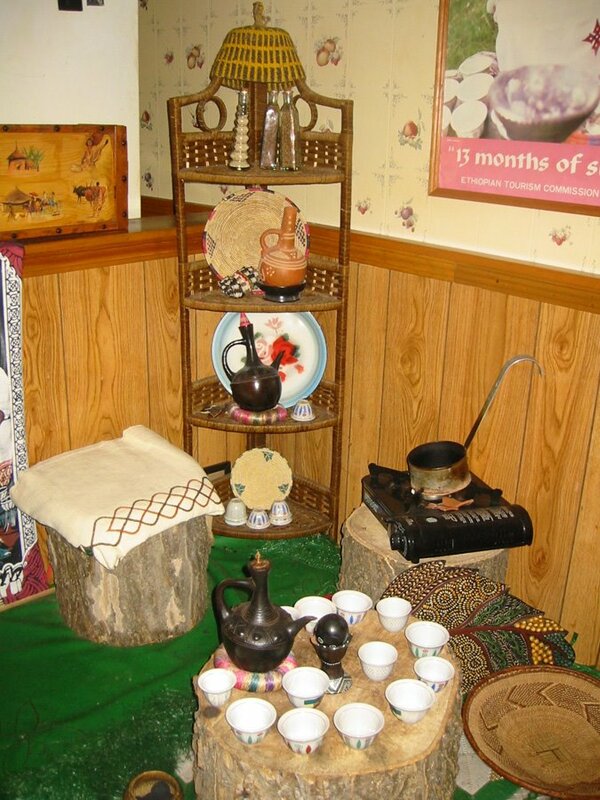 The history behind this place is that a young Ethiopian couple took over ownership of this place about 3 years ago. They have redecorated, shut the floresent lights off and added subtle lighting, added background music, and started cooking rather soulful home style Ethiopian recipes. Before that, the former owner let too many off-the-clock cab drivers hang out to smoke and drink tea, the place wasn't that clean, and the recipes weren't that good. Now, the cabbie contingency is less, there is less smoke in the air, there are usually another table or two of multi-ethnic diners, the tables seem to be clean, and the cook is making consistent food. The owners have set up some mossobs, woven basket tables that is the size to hold the communal plate, as well as tables commonly found in many USA restaurants. I prefer tables over mossobs, but that is just me. The injera (flat sponge bread) is made of teff, a brownish-grey grain that is fermented before ground into flour to make this bread. I love this bread! 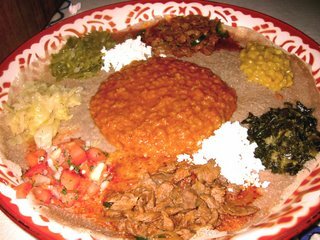 Horn of Africa serves food traditionally, meaning that you take a small piece of injera in your right hand, use it as a scoop for the stew types of food that are offered on a giant communal plate in the center of the table, and place the tasty treat in your mouth. The great part about Ethiopian food, and Horn of Africa is that you can go completely vegetarian here. The Veggie Combo 1 includes home made cottage cheese, chickpeas, red lentils, green beans, cabbage, collard greens and tomatoes, which is more than plenty for 2, and less than $7 total (that would be $3.50 per person). Ask to leave off the cheese, and you got yourself a perfect vegan meal. We generally get a meat dish too, and the last time we got awaze tibs, small pieces of stew meat stewed with tomato, jalapeno, garlic, onion and a berbere sauce. Berbere is a sauce made from stewing a heck of a lot spices like corriander, cardamom, all spice, tumeric and others to make a delightful aroma and flavor. To add on a meat dish, it adds about $8 to the bill, and more than enough for 3 people. 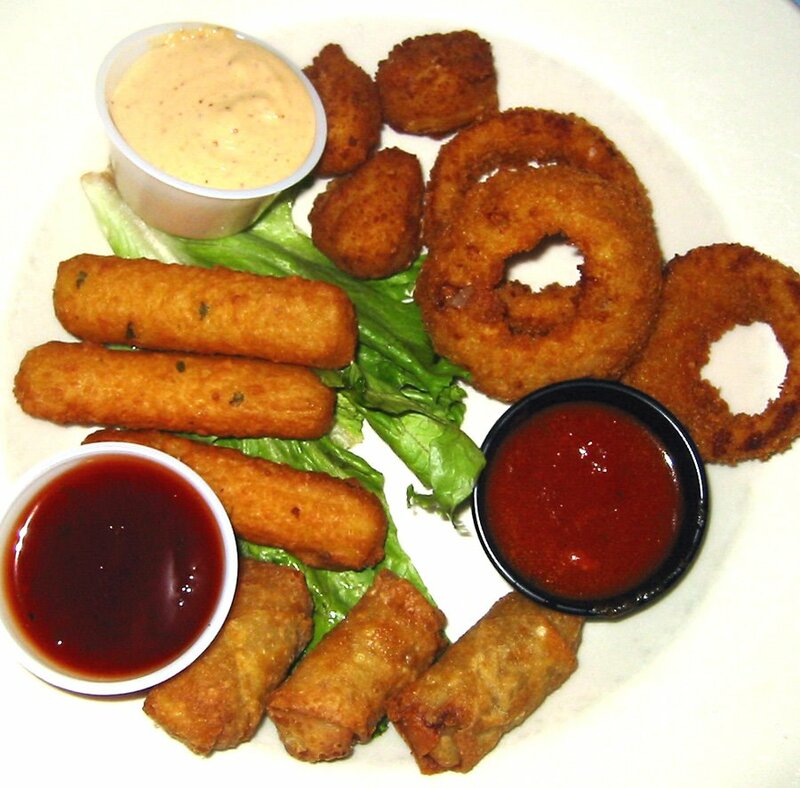 The overall cost for 1 veggie combo and 1 meat dish is $15, or $5 per person in a party of 3. I really like eat Ethiopian food because it fosters communal eating, creates a group of people sharing a meal (instead of segregated plates in American style where no one shares), slows down the pace to allow talking about the day, and offers flavors you cannot get at chain restaurants. I am so thankful that there is one Ehtiopian restaurant in Nashville that is tasty, inexpensive and nice. The sign says it all. 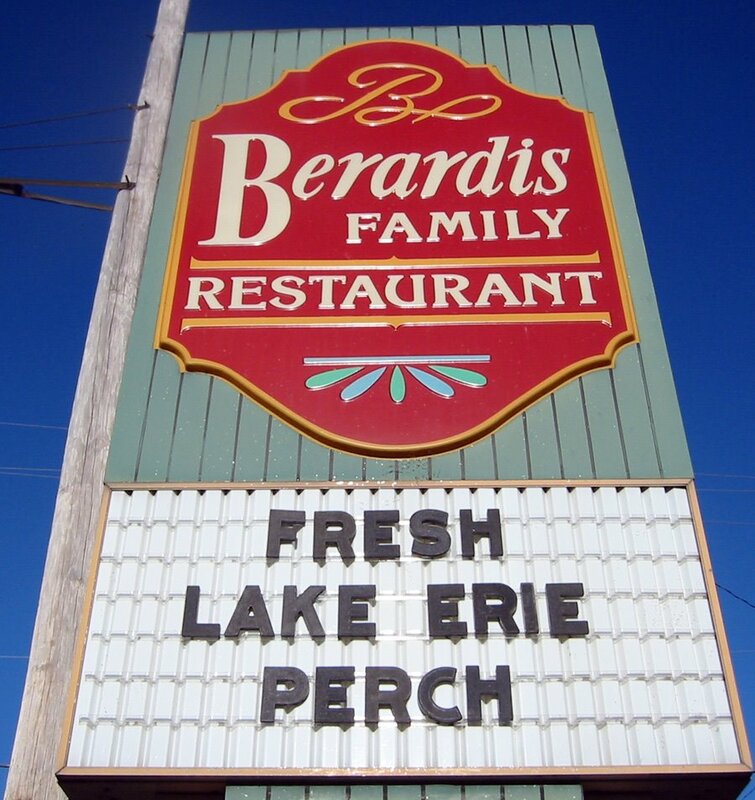 This is a traditional Ohio lake town restaurant with a lot of fried Lake Perch being served. 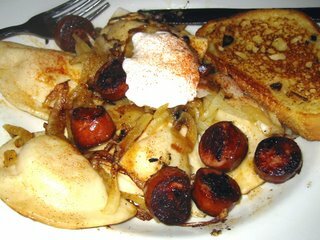 The fare here includes fried cheese, fried saurkraut balls, onion rings, fried calamari, to start; for lunch there are soups, salads, and burgers with fries; for dinner there are some Polish dishes like piroghis with kielbasa, or cabbage and noodles with kielbasa, and there are Italian dishes like spaghetti with meatballs, raviolis, or chicken parmesan. This place is cheap, and seems like a throw-back to the 1970s. How do you start this dinner off right? You guess it, with an app combo platter with fried cheese, mini eggrolls, fried saurkraut balls, and onion rings. That is exactly what you are supposed to do at this restaurant. I got the piroghis with kielbasa off the Polish menu. The dinner was huge, and I could not finish it. 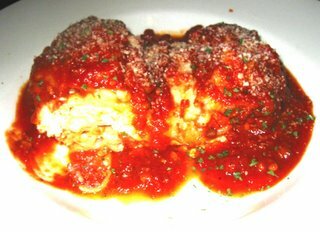 My dinner mate got something off the Italian menu which was the lasagna. It was cheesy. The amount on the plate was huge and my friend could not finish it either. This place, the waitresses, the room dividers, the old plastic cups, all look like they came out of a 1970s Denny's. Some of the recipes tastes like they could have come from the 70s too. 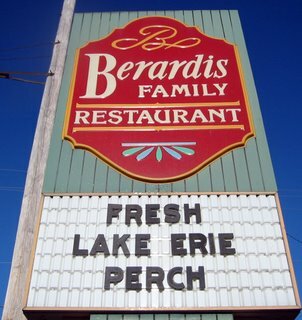 I had just gotten my haircut to look a bit more like That 70s show, so I seemed to fit right into the decor of Berardis. Many of the patrons look like the retired set, and they seem to enjoy this dining experience, and perhaps it may seem familiar to them. For the retired folks eating at the restaurant, it must remind them of the style of dining they had when they were in their 30s and 40s at the prime of their life. Perhaps the sites, sounds, smells and tastes remind them of the good ol' days, or they way things should be.